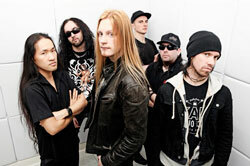 DRAGONFORCE, known for their over-the-top, infinitely fun, wildly entertaining live show, which has slayed the main stages of Ozzfest, Rock Star Energy Drink Mayhem Festival and countless headlining shows the world over, have captured the whole shebang on Twilight Dementia, a double-CD which documents their Ultra Beatdown tour. The tour ran from 2008 through 2009 and includes tracks from all of the band’s albums, including the hit “Through the Fire and the Flames,” which was featured on Guitar Hero. The two-disc affair will be unleashed on September 14.